Thanksgiving 2001 (late November to those outside American culture) was coming up with an imported mascarpone tub sitting in the fridge dated September 2001, left over from an August tiramisu in which the key ingredient had somehow been forgotten. During the assembly, bob had cut down on the whipped cream from 1.5 to 1 cups since the previous experience seemed to have produced a bit too much batter for the usual 9 inch spring-form pan destination. While noticing that this intended small reduction seemed to have resulted in much less batter than intended, bob did not think about any other possible contributions to this state of affairs and just made do. Guests complimented the product, while bob said there was still something not quite right, blaming his tinkering with the liqueur component which had still not met his satisfaction. Yeah, no mascarpone does make a bit of a difference, but surprisingly not as dramatic as one would think. When bob discovered the still virgin container hiding behind some other stuff in the fridge a few weeks later, the facts suddenly fell into place. Being an Italian product, the date interpretation was ambiguous. No helpful "Use by..." or "Sell by..." language for clarification. But the stuff is pasteurized and sealed, so what's a few months more or less. It turned out to be fine. However, the approaching and then receding date did create an increasing pressure to find the right occasion to do another tiramisu. Which is when an issue of the woman's magazine Rosie ripped off from a doctor's office waiting room by a sister-in-law for another recipe crossed bob's path. 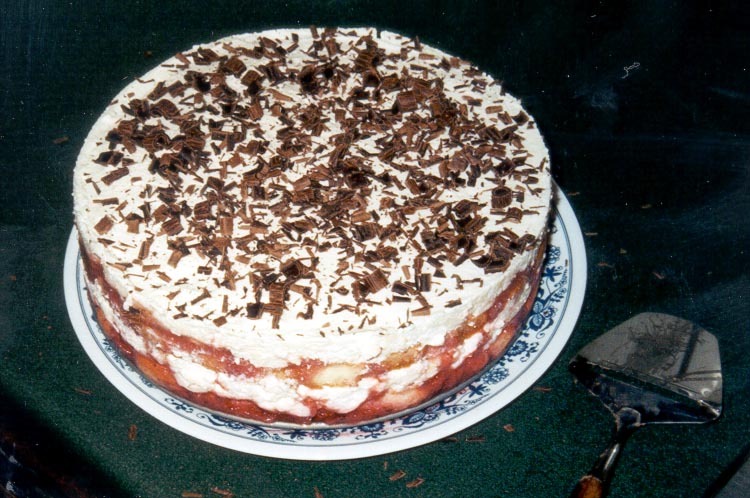 And the strawberry tiramisu recipe popped out, reminding bob of his first such experience with this converted traditional tiramisu dish two decades earlier on Procida just off the coast of Naples. Most people of a certain experience have heard of Capri (although usually mispronouncing it), the jet set destination also just off the coast of Naples, at least for the people who stay the night, which bob has never done. Procida is the larger down-classed version that regular people from Naples can vacation on and even spend the night, leaving the also nearby intermediate class island Ischia as a compromise, both of which do not carry "bob slept here" signs even though he did so in both islands. Anyway, Laura must have seen this food concept somewhere because when they had to improvise a dessert for a little group dinner on Procida, under primitive conditions in somebody's getaway home, something like this was the result. Nevertheless, the authenticity of Rosie recipes lacked some credibility in bob's mind, so he tried a web search, including a leading Italian site, for alternatives, finding none. Okay, it seemed pretty reasonable as a stretch from the usual tiramisu, so bob decided to follow it exactly to see what would happen. bob had to go out and buy some creme de cacao since more than a decade had passed since he'd last used it for a chocolate cheesecake. And although using frozen strawberries crossed his mind, reasonably looking real world strawberries were found in a supermarket that were acceptable, considering they were destined to be pureed anyway. But in a 1 lb container. Leading to 2 cups of puree instead of 1 1/2 c = 2 x 3/4 c as one can infer from the actual recipe. And the imported mascarpone comes in 500 g =17.5 oz versus 16 oz = 1 lb containers so a little extra went into the mix, which probably would have been a little less lumpy when combined with the whipped cream if bob had left it out a little longer to warm up. Still worked. Puree the berries, sugar and 2 T creme de cacao in a blender. The result is a very liquid puree. Mix 1 T creme de cacao with the mascarpone and confectioner's sugar in a large bowl. Whip the cream and fold into the mascarpone. This is a lot easier if the mascarpone is really warmed up to room temp. Our batter looked really lumpy like it was filled with miniature marshmallows. But it worked just the same. Pour half the berry liquid into a pie plate or bowl for dipping the ladyfingers in. About 13 will do for each layer in a 9 1/2 in spring-form pan, if you break those that don't fit and wedge into the gaps. Roll each ladyfinger around making sure the ends get coated too and then lay it down in the liquid to soak through, continuing on with as many that fit. Check them to make sure they don't oversoak and begin to fall apart. With regular tiramisu, the diluted coffee is absorbed in seconds so one has to be quick, but with this more viscous strawberry fluid, the same kind of dipping resulted in only thin surface penetration which derailed the tiramisu effect, as we noted on the first run of this recipe. As the ladyfingers appear to be soaking through (break one open to check), fill in the bottom layer side by side. Use your imagination here. Then dump what remains of the berry liquid from the first half over the middle of the ladyfinger layer and spread around. And carefully cover with half the batter, spreading it around like icing, a bit difficult since the liquid base is not very cooperative if much remains from the soaking phase. Repeat with the second half of the liquid and batter. Cover and refrigerate at least 6 hours for the lady fingers to absorb the berry liquid. Garnish with chocolate shavings at serving time. From Rosie Magazine, May 2001, pullout recipe insert. Another celebrity getting her more than 15 minutes of fame: Rosie O'Donnell. Her magazine didn't last long though. At 9 servings, each serving has: 515 Cal, 7 g Prot, 38 g Carbo, 37 g Fat, 2 g Fiber, 210 mg Choles, 81 mg Sodium. No surprise. This is not a light dessert. Just to experiment, bob mixed some gelatin with the residue of the berry mixture and 2 T of really hot water, since he was too impatient to boil some. And mixed it into the second half of the berry liquid as a test, with the first layer acting as a control. No visible difference afterward since the liquid phase condensed anyway. The largely unsoaked ladyfingers contributed to a disappointing total impression compared to the real tiramisu in our first attempt, leading to the soaking revision incorporated above, but the contrasting chocolate shavings could also be improved by shaving them directly into the batter before spreading in either layer since the few shavings on the top do not find their way to the forkfuls coming from below. We used part of a 3.5oz (about 100g) Perugina bittersweet chocolate bar and a cheese slicer to shave the chocolate onto the top. Maybe 2oz could be folded directly into the batter, and then the final oz prior to serving for the presentation. Finally the liqueur component was not very evident and so could probably be safely doubled in both steps to kick it up a notch, which is what the original recipe needs.